"Look at the dolphins!" Bruce squealed in delight. "There are five of them. See how they jump out of the water!" "I see them. They’re beautiful. Oh, look, Bruce. There are some seals in the water too. Is that a whale?" Bonnie asked. "Oh, it is! This is exciting, seeing dolphins, seals and whales at the same time!" Bruce cheered. "We must be at the very north of Scotland by now, aren’t we?" Bonnie asked. "Yep! We’re near a village called Durness. There are so many things to see and do in this area. I heard some butterflies talking about it when we were down south," Bruce said. "You listen to everything, don’t you?" she chuckled. "Just about. It’s how you learn things. There is a cave nearby, called Smoo Cave. It’s the largest limestone cave in Britain, with a huge entrance and a blowhole too. Also, Cape Wrath, which is the most northwesterly point in all of Britain, is not far, about sixteen or seventeen miles west. There’s a lighthouse there and it’s very rocky with tall cliffs," Bruce explained. "Sounds nice, but my wings are a bit tired to go much further right now. How about heading for Durness and finding some flowers to sip on?" Bonnie begged. "Sure, Bonnie," Bruce smiled and the two butterflies headed into the village. "Puffins!" Bonnie said, pointing at the birds as they flew by. "They’re called the Clowns of the Sea. They look like clowns, don’t they? I love their beaks. They’re so colorful. Oh, there’s Durness now," Bruce pointed. They flew past a sign. "What is that other word under Durness?" Bonnie wondered. "I can’t even pronounce it, D-i-u-r-a-n-a-i-s."
"It’s the name of the town in Gaelic. A lot of the people up here in the north still speak Gaelic, the old Scottish language," Bruce said. "I see. What do the people do who live here? It’s quite nippy and windy. All I can see are sheep," Bonnie asked. "I’m sure raising sheep is what they do and fishing," Bruce said as the butterflies landed on a wooden fence post. "I don’t know if we’ll find flowers up here. We’re at the very top of the country." "Even up here, there will be flowers. It’s summer and people love flowers, no matter where they live. My proboscis will find them," Bonnie smiled. They flew off, searching for flowers. "Aha. There you go. I see some color down there in that back garden." "You’re right, Bonnie. There are flowers. What are they though?" Bruce asked. 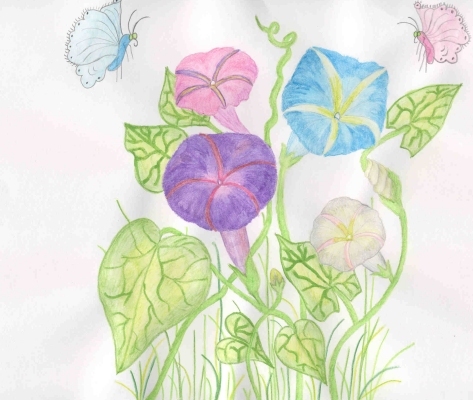 "They’re morning glories and they’re lovely. Look how pretty the blue is, and the purple, and the pink ones too. You know why people plant morning glories, don’t you, Bruce?" Bonnie chuckled. "Because morning glories keep fairies away," Bonnie answered. "What’s so bad about fairies?" Bruce questioned. "Nothing, to us, but people they are afraid of them." "I wonder why? Never mind, let’s have a bite to eat then. You take the blue flowers. I’ll take the pink," Bruce suggested. As they sipped, Bruce added, "They have stone circles around here, sort of like Stonehenge, in England, but not as big or as famous. The mountains are made of Lewisian Gneiss." "What is Lewisian Gneiss?" laughed Bonnie. "It’s a type of rock. Look at the mountains. They’re dark and rugged, aren’t they? There is also a lot of moorland too." "I’m sure the moors are covered with mosquitoes at this time of year. Let’s avoid that area!" Bonnie urged. As they sipped the nectar, a wind began to blow. Rain began to fall. The butterflies hid under the leaves as the rain beat down. "It does rain hard here," Bruce said. "We’d better stay under the leaves until it passes." Just then a small kitten came scurrying towards them. It skidded and landed with a thud, right next to the butterflies. "MEOW! MEOW! MEOW!" it went. "Poor kitten. It wants to share the leaves with us. It doesn’t like the rain either," Bonnie said. After a while the rain stopped and the sun came out from behind the clouds. "MEOW! MEOW! MEOW!" went the kitten and then it ran away. "Funny thing, that was. Cute little kitten, though," Bruce said. "Back to the morning glories?" he asked. "You’ve got that right," Bonnie smiled. "Say, when we’re done here, let’s head for that Smoo Cave and then on to Cape Wrath. I’m in the mood to see more of this most-northerly stuff." "Anything you say," Bruce answered and the two butterflies went back to sipping the nectar.